Call (480) 464-2543 for Great Pricing On Embroidered Shirts, Hats & Clothing! Rainbow Graffixx Offers the Highest Quality Workmanship! 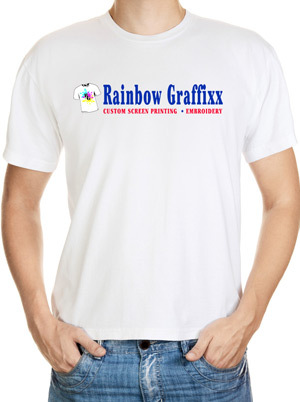 Welcome to Rainbow Graffixx, your Mesa, Arizona embroidery provider. We offer a wide variety of products designed to properly create and build your brand. We can help your business or personal items make a statement in any situation! Our embroidery products consist of t-shirts, hoodies, hats, sweatshirts, polo shirts, bags, jackets, sports jerseys with screen printed numbers, baseball caps, clothing accessories, youth sports gear, and much more. We are your complete custom clothing embroidery company in Mesa! We offer our services to customers in need of quality, custom-made promotional products, screen printing, embroidery, and more. Call our shop today at (480) 464-2543 for questions and to place phone orders or click here to begin shopping online now!